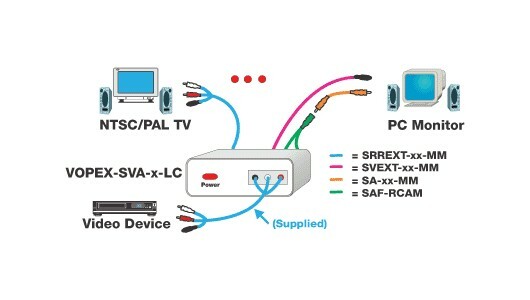 The VOPEX-SVA-4-LC S-Video/Audio splitter accepts S-Video and audio signals and broadcasts them to multiple output displays with support for numerous devices (TV, monitor, home theater system, projector, etc.). The same image is displayed on all outputs with no degradation, and the same audio is sent to all speakers. Supports high resolution SVGA (800x600) output. Economical way to expand the output of numerous devices (DVD player, cable box, satellite receiver) to multiple TVs. Female 4 pin mini-DIN input connector. Four female 4 pin miniDIN connectors. 800x600 resolution with no degradation. One set (R&L) of RCA audio jacks. RCA audio jacks (right & left speakers). 110 VAC at 60 Hz via AC Adapter. 6-foot dual RCA audio & S-Video combination cable, male-to-male.